For centuries, the rich and beautiful sounds of the viola remained tucked away in ensembles, forgotten between the brilliant tones of the violin and deep sonority of the cello. Only in more recent years has the viola grown to be recognized as a soloistic instrument. Over this time, the world has come to see the viola’s rich tones as deeply beautiful and powerful, with many lauding the instrument for its versatility and its semblance to the human voice. Join violist Deanna Badizadegan to explore this once hidden “inner voice” in an afternoon of works for the viola, accompanied by her teacher and celebrated pianist Paul Hersh. 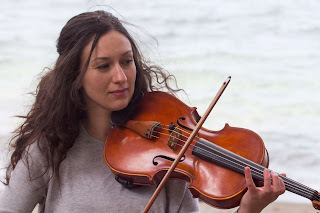 As a violist, Deanna Badizadegan has performed across the US, Europe and Asia. She holds degrees from Stanford University and the San Francisco Conservatory of Music, where she studied with Paul Hersh, Lesley Robertson and Jodi Levitz. Growing up in Boston, Ms. Badizadegan was a student of Michelle LaCourse and studied for many years through the New England Conservatory’s Preparatory School Program. In addition to her work as a musician, Ms. Badizadegan loves to help others unlock their creativity through music and the arts. She teaches and coaches entrepreneurship and innovation using a combination of music and improvisation techniques, and has given talks and run workshops for Stanford, TEDx, and private groups.